God of mercy you chose a tax collector, Saint Matthew, to share the dignity of the apostles. By his example and prayers help us to follow Christ and remain faithful in your service. We ask this through Our Lord Jesus Christ, your son, who lives and reigns with you and the Holy Spirit, one God, forever and ever. Dear Jesus, I have sinned against God and you. I have gone against you and hurt you with each and every sin I have committed. I am not worthy of your love, but you are my only hope. Please save me, and please forgive me, for I am lost without you. 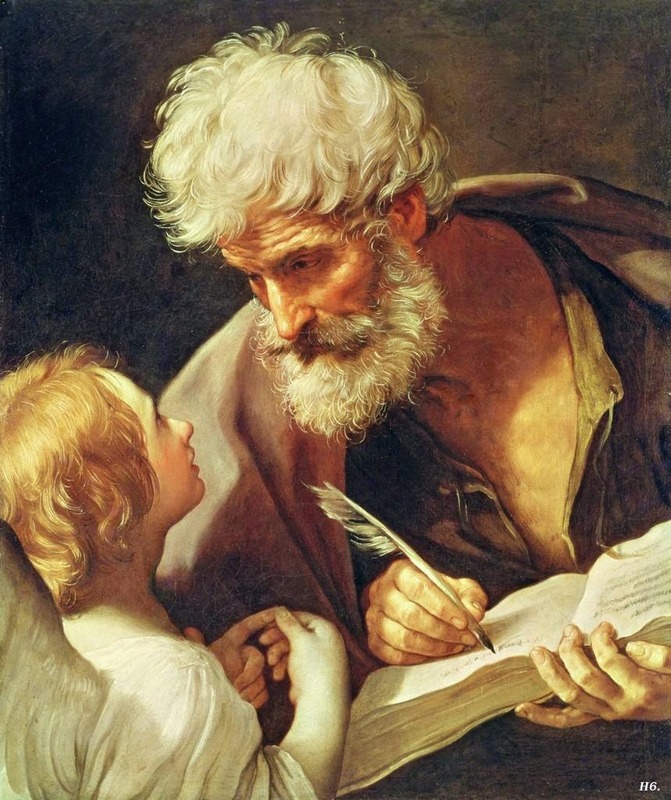 Saint Matthew, as you were one of the lucky twelve who walked the Earth with Jesus by your side, you were continually made aware of your own nothingness before his greatness and saw many evidences of God’s immense grace. Help me to be so poor in spirit that I acknowledge my own nothingness before God on a moment-by-moment basis, and please intercede with Jesus in asking him to grant my desperate request, (STATE REQUEST). Dear Jesus, even though I have committed such grave offenses against you and God, you still loved me enough to give your life for me so I could be free in Heaven. With all my heart, please forgive me for ever having offended you. I know it was my sins that condemned you to die. I love you more than I love myself, and can do nothing without you. All that I am and all that I hope to be is solely because of your grace and mercy and nothing else. Saint Matthew, as a former tax-collector, you were considered one of the worst sinners, but Jesus called you anyway to be one of his apostles. Help me to truly mourn for all the sins I have committed and please intercede with Jesus in asking him to grant my desperate request, (STATE REQUEST). Dear Jesus, I know that I can do all things through you who gives me strength, but not according to my will, but yours. Therefore, I submit my will totally to you. Although evil may seem to triumph, these are temporary triumphs indeed, because the meek, not the wicked, shall inherit the Earth. Saint Matthew, you gave up a life of worldly pleasures to follow God’s word made flesh in Jesus, trusting that he would take care of all your needs. This must not have been easy, since you came from a life of privilege. Please help me to have the quality of meekness before God constantly being produced within me, relying on his strength for every move I make and every action I take, and please intercede with Jesus in asking him to grant my desperate request, (STATE REQUEST). Dear Jesus, I want to be just like you. Please lead and guide me so I can live my life completely in conformity with the will of God, going contentedly wherever his will takes me. Help me to do everything just as you would. Saint Matthew, you left behind a very financially lucrative career and the ways of the world to follow Jesus’s way instead. Help me to constantly hunger and thirst for righteousness just as you did, and please intercede with Jesus in asking him to grant my desperate request, (STATE REQUEST). Dear Jesus, thank you for the mercy you have shown me time and time again, even when my actions have not merited it. Thank you for comforting me in times of sickness and trouble. Help me to look at everyone I come across with a tender heart, truly feeling in my heart the pain and suffering of others. Help me to always make the effort to ease the pain and suffering of others, with an ever ready, always affectionate, and joyful heart. Saint Matthew, as an apostle, you were an extension of Jesus in the world. You got to see his kindness and mercy displayed firsthand and then were asked to emulate it. Help me to emulate Jesus by demonstrating true kindness and mercy to others, just as Jesus did, and please intercede with Jesus in asking him to grant my desperate request, (STATE REQUEST). Dear Jesus, I have so often let you down because of my impure heart; please forgive me. Help me to be pure in my imagination, in my thoughts, in my words, in my decisions, and in my desires. Help me to think how God thinks, desire what God desires, hate what God hates, and love only what God loves. Please make my heart completely free of all evil thoughts. Saint Matthew, I know you understand what it means to struggle with maintaining a pure heart because you were a man and struggled with the desires of the flesh just as I do. Help me to remain truly pure in heart, and please intercede with Jesus in asking him to grant my desperate request, (STATE REQUEST). Dear Jesus, first and foremost, help me to find peace with God, for only then can I find true peace with others. Help me to do whatever it takes to create peace wherever I go, although my efforts may often meet with failure. Help me to love, desire, and delight in peace. Forgive me for all of the times my actions have resulted in discord and dissention, whether intentional or unintentional. Saint Matthew, you made your peace with God through Jesus, now please help me to make mine. Help me also to sow peace wherever I may go, just as you did, as a witness to Jesus Christ, and please intercede with Jesus in asking him to grant my desperate request, (STATE REQUEST). Dear Jesus, please show me how to persevere in this struggle for things which are holy and honorable, because I fall down and grow weak so often. Help me to be faithful to you in all things, so that your will may be done in and through my life. Help me to be bold in my steady struggle for faith and unwavering in my commitment to all Godly things. Saint Matthew, please guide me to be courageous like you in standing on the side of God’s truth, even in the face of being persecuted for righteousness, and please intercede with Jesus in asking him to grant my desperate request, (STATE REQUEST). Dear Jesus, as the times in which we live become darker and darker, living by your ways and following you is branding me in such a way that invites persecution and insult, just as it did you. If I live by your ways and love you with my whole being, I live by the light and provide a target for those who do not live by the light. Sinning is what gives most people pleasure, but I can no longer live that way, because I am aware of how much you sacrificed for me in love by dying on the cross. For all that you have done for me, I no longer desire to live in the darkness. Each time I receive an insult for belonging to you, please help me to bear it with great patience. Saint Matthew, in being given the awesome honor of being chosen to be an apostle, you were persecuted just as Jesus was persecuted. You felt, however, the persecution you experienced was also a great honor, because Jesus was not just a man, but he was indeed God. Help me to be strong enough to love Jesus’s light and to run from the darkness of sin and then, when persecution comes, to be strong enough to handle that as well. And please intercede with Jesus in asking him to grant my desperate request, (STATE REQUEST).